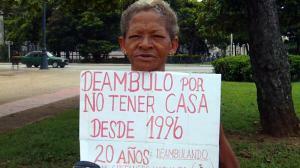 Miriam Castañedo Morales has been wondering about the streets of Havana with a sign claiming her apartment back. She accuses the Municipal Housing Directorate of having taken away her apartment when she was imprisoned. Miriam was sentenced at the age of 27 to 4 years of imprisonment in the Western Prison for Women. She served her sentenced and was released in 1996. However, when she wanted to return to her apartment she saw that it was occupied by a family she did not know. Miriam Castañedo Morales says she has not had and refuses to have any accommodation in a hostel. Today she makes her living in a shoe store. She learnt the trade in the female prison with a great will and dedication.